This original flavour is tasty, creamy, tangy. Super on bread or toast! Cumin is very popular, yet that taste is lacking in the selection of vegan cheese alternatives. Well until now! At Fervena they are fond of cumin and happy that it tastes surprisingly soft in their product. 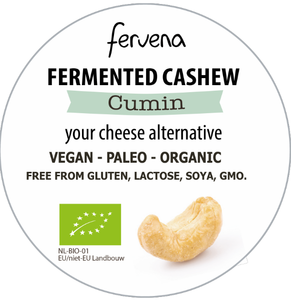 Fervena Fermented Organic Cashew cheese alternatives are made from a few simple ingredients: premium cashew nuts, water, salt, and vegan cultures. With the aid of a specially developed, natural process, the nuts are fermented and an irresistibly tasty product is created! By adding herbs and/or spices to this, the Cracked Black Pepper, Cumin and Herbes de Provence are also conjured up! Fantastic on bread or crackers! Energy: 1673KJ / 401Kcal; fat: 31.9 g of which saturated 5.9 g, carbohydrates 14.2 g of which sugar 3.7 g, protein 13.8 g, salt 1.3 g.